Typeform is one of the best tools to create online form. You can use this tool to create any type of online form. But, what if — for some reasons — Typeform can’t cover your needs anymore?. Or simply you once got a problem with Typeform and want to switch to another tool? If your business or position requires you to regularly create online forms, then I can feel you how it feels when the tool you usually use doesn’t suit you anymore. Fortunately, there are many Typeform-like tools you can use to accomplish your job of creating online forms. So, it doesn’t matter if you want to switch away from it. Below are online form builder tools you can use as a Typeform alternative. On the first list Typeform alternative we have TellForm. This is the best choice if your reason of switching away from Typeform is to look for a free alternative. Well, you can basically also use Typeform for free, but there are some restrictions here and there that probably make you less comfortable. TellForm is totally free to use. 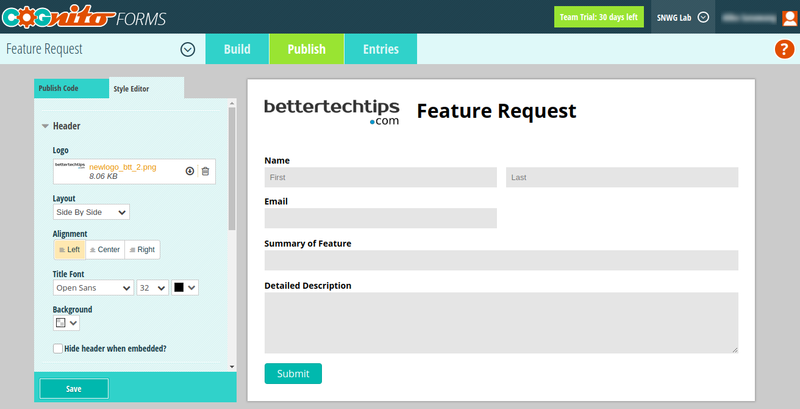 Best of all, you can get the source code of TellForm to build your own online builder tool. Yess, TellForm is an open source online form builder. The source code of TellForm is available on GitHub. TellForm is licensed under the MIT License. The features offered by TellForm are so much comparable to Typeform. You will get an analytics tool to see how your users complete your form and track their behavior. You can also spread the form you created via link or by embedding to your site. The only minor is that TellForm doesn’t offer tens of ready-to-use template like Typeform. JotForm uses the same business model as Typeform. It is also a freemium tool, meaning that you can use it without spending a dime. However, your form will be bothered by a JotForm logo if you stick to your free account. The JotForm logo is located at the bottom side of your form, while your logo (yes, JotForm allows you upload your company logo) is located at the top side of your form. But still, the presence of JotForm logo will bother a bit. It’s not funny to see your company logo adjoining with JotForm’s. If you have no problem with this, then JotForm is a great choice to replace the Typeform role in helping you to create online forms.The most stand out advantage of JotForm is that it has a theme store in which most items are available for free. Price is not always the reason that leads someone switching away from a tool to another one. Some people tend to pleased to use a premium tool instead of free. If you are a sort of that person, Paperform will probably suit you. This online form builder doesn’t offer a free version at all, but you are given a 14-day free trial to try it out. If you use MailChimp, you can integrate it with Paperform to directly add emails submitted from Paperform to a MailChimp list. There are over 20 field types you can apply to your forms. You can also spread your forms by embedding them to your website or via link. 123FormBuilder is one of the closest competitors of Tyform. You can also start your form from a template instead of blank space. There are hundreds of free template forms offered by 123FormBuilder you can choose from. Sadly, free account is only allowed to select 10 fields per form. Free account is also limited to 5 forms with a backlink is required. One of the form types you can create with 123FormBuilder is event registration. You can embed Google Maps when creating an event form. Embedding a form to website is also easy. 123FormBuilder supports some blogging platforms including WordPress, Blogger and Joomla. Formable tends to ideal to create a simpler form like contact form or subscription form. There is no template offered at all. You can only add four type of fields on your form; text field, radio button, check box and select box. Free account is only allowed to create one form. The features offered by Formable are also very minimum, but if you want to create a very simple form then Formable is may be exactly what you need. Formlets is a great online form builder if you need to collaborate with your team to create a certain form. You can invite other users to preview your form first before it’s published. You will also be helped by form templates if you have no idea about the form you want to create. The type of form you can create with Formlets is traditional form which may looks less appeal to some people. At least there are more field types you can add to your form than Formable. You can also add a Google Captcha if you need it. Formlets itself is a freemium online form builder with free account is only allowed to publish one form. Cognito Forms is also online form builder that you can use with your team. It’s just, you need to upgrade your free account to do that. Same as the majority of online form builders above, Cognito Forms is also a freemium tool, but you are allowed to create unlimited forms with this tool. There are also dozens of free templates you can use. Cognito Forms is one the best Typeform alternatives. Cognito Forms is a feature-rich online form builder. You can add more elements with this tool, including file upload and payment. If you use WordPress, there is a plugin offered to create new forms from the WordPress dashboard. Wufoo is another online form builder you can use as a Typeform alternative. This tool is owned by SurveyMonkey, an online survey tool provider. 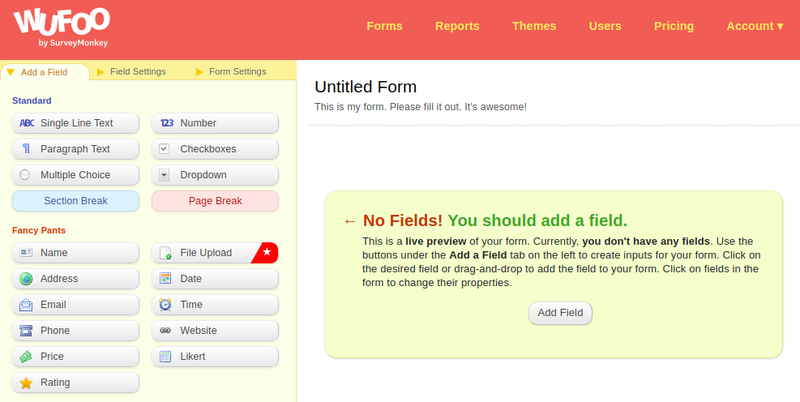 As you can see at the screenshot above, there are several types of field you can add to your form. 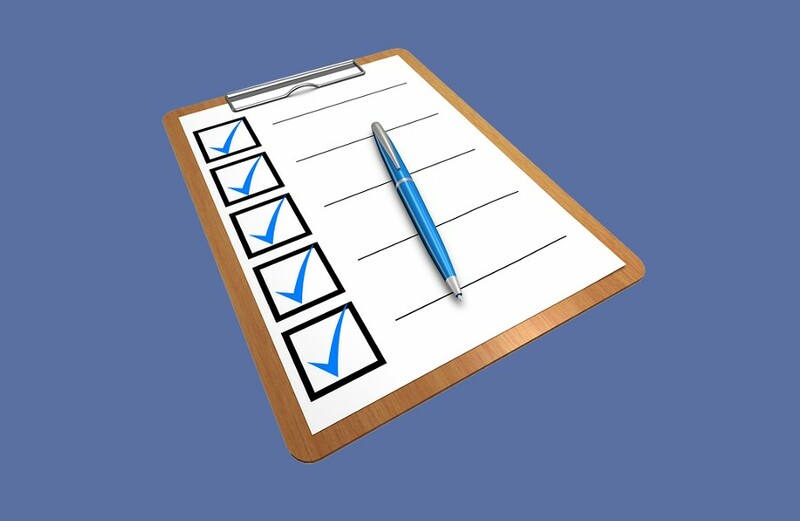 The availability of over 400 form templates will help you to get the form done quicker. You can also spread your forms via link or by embedding to your site. Wufoo is also a great tool if you are a user of MailChimp since you can integrate them. The integration helps you to add new contacts to your MailChimp list automatically. Wufoo itself is a freemium tool with free account is limited to 5 forms. Other useful features offered by Wufoo include analytics tool, captcha integration and webbooks. 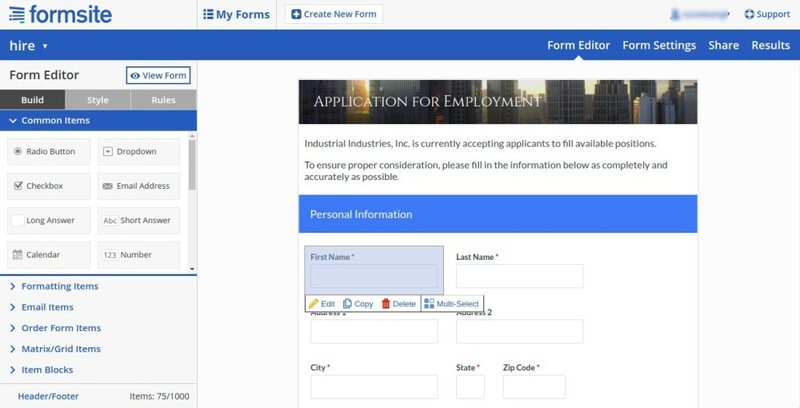 If you need to create a complex form, like employment application, Formsite is probably the tool you need. To streamline your job you can make use of the available form templates. There are over 100 free form templates you can choose from, which are divided into 13 different categories from business, education, registration, marketing and so on. Formsite allows you to add a footer and header to the form you are creating. There are three ways to share your forms; via link, embed code and QR code. Last but not least, other Typeform alternative you can use to create an online form is Google Forms. This tool has one thing in common with TellForm. It is fully free to use. You can even also invite other people to join your form. There are several free templates you can choose as well. 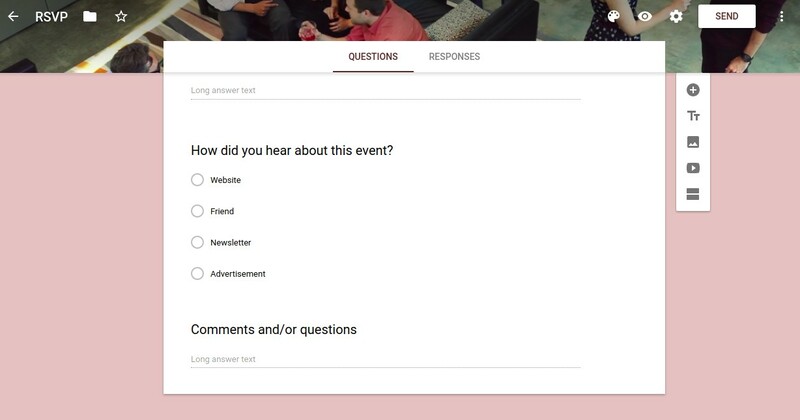 Some available templates offered by Google Forms are RSVP, contact information, party invite, event registration, event feedback and so on. You can also create a form from a blank space if you can’t find the suitable template. When creating a form, you can also embed a YouTube video. You can also embed your forms to your website as long as your website platform supports IFrame. Previous articleWhat Is an ISO File and How It Is Used? And the number of templates is growing. Thought this should be corrected. Thanks!